Our archery team won the 2016 NC S3DA state championship. We also swept the top three spots in the Pin division boys and the pin division girls. We also have the state champion in the open division. We also had a student place 4th and 5th in archery at the International Student Convention in Warrensburg, Missouri. The Scholastic Archery Association, DBA Scholastic 3-D Archery, is to foster, educate and guide youth in the area of 3-D archery. Scholastic 3-D Archery will design, promote and foster national youth and high school 3D archery competition as an after school program affiliated with educational learning institutions, sportsman’s clubs and archery dealers. Establishing and enforcing rules, regulations, and procedures concerning eligibility to compete in order to ensure fair competition. Cornerstone Christian Academy’s archery club team has come a long way in a short time. Two months after resurrecting its program, Cornerstone scored high marks during the Accelerated Christian Education (ACE) regional student convention March 21-25. Youth ages 13-18 attending schools from seven Southern or Mid-Atlantic states and one from the Cayman Islands were represented in the multi-sport challenge in Brevard. Cornerstone trumped them all. They were especially on target in archery. Six medals were awarded in each of the eight archery divisions. Cornerstone earned 31 of the 48. The breakdown: first place (four); second place (six); third place (five); fourth place (five); fifth place (seven); and sixth place (four). Not a bad showing for a club that began in January with less than a dozen members each of whom lacked experience with a bow and arrow. Expectations were exceeded in Brevard, Griffith said. “I told them we were going to be competitive because they had done tremendous,” he said. By virtue of their finishes at the regional, those archers placing in the top six qualified for much larger events in the coming months. In May, they will travel to Warrensburg, Missouri, to participate in an ACE International Student Convention. Then in July, it’s off to Metropolis, Illinois, for the Scholastic 3-D Archery Nationals. Bobby Griffith, co-founder of Cornerstone Christian Academy, started an archery club in January with 10 students who had never before used a bow and arrow. Now the group has grown to 25 and counting, and participants are doing well in competitions around the state. Cornerstone had an archery club when it opened more than two decades ago. Bobby’s older sons, Caleb and Christian, participated, but the boys and other students lost interest and the club faded away. Bobby’s youngest son, C.J., a third-grader at Cornerstone, brought up the idea of starting the club again in January. Bobby, who enjoyed recreational archery as a boy and bow hunts as an adult, decided the club would give students a way to compete at competitions all over the state. According to the Scholastic 3-D Archery website, Cornerstone will be the fourth school in the state to have an S3DA-affliliated archery club. The members meet three times a week to practice and are taught how to shoot long, recurve and compound bows. “Archery has given me a way to release a little after school,” said Nathan St. Clair, a junior at Cornerstone. Elise’s brother, Sam, recently participated in the Northwest NC Regional Circuit at the Foothills Archery Shoot and finished fourth in the youth division. Senior Will Stidham, a beginner at archery, won at the same competition. Renee Griffith, principal at Cornerstone, said the non-traditional skills archery teaches help students greatly in the classroom. 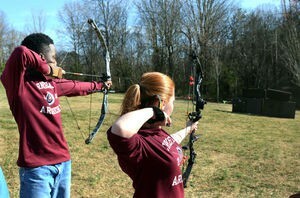 Renee said she saw students involved in archery become more confident and focused on their goals. A junior who has ADHD and struggled in class has improved in the classroom since he joined the club, she said. The club is open to students 13 and older, but Bobby plans to expand it to include third- and fourth-graders after the team’s competition in Brevard on March 21. He also hopes to introduce archery to other Christian schools and public schools in the area. CCA does not discriminate on the basis of race, gender, economics, country of origin disability, or ethnic background. What Makes a Christian Private School Different?